You need software that juggles tasks, resources and costs, allowing you to better manage your projects - from start to finish - that's Project Plan 365, packed full of features and benefits that every manager can use. Project Plan 365 works on all iOS and Android devices, so no matter what you are using at the moment, you can always get to your plan. Your files can be stored in any of the many cloud services supported, so sharing your work could not be easier. Give it a try on your favorite device! 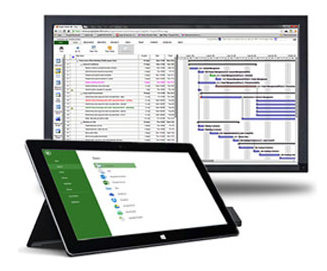 Project Plan 365 works on both the Windows and Mac platforms - as well as on the Web and with SharePoint, so no matter if you are in your office using your own desktop, or somewhere else using a shared terminal, you always have your plan on hand. Give it a try on your favorite platform! Project Plan 365 builds on familiar scheduling tools, and adds features not found anywhere else – all at a relatively low-cost per user. For example, this app creates industry-standard Gantt charts, allows you to control resources and calculate costs for people and materials. Project Plan 365 even supports critical paths, baseline comparisons and more! Project Plan 365 is built for collaboration, where you share your project plans with anyone in needs - without the overhead of complicated server systems and costly backend-software. And with our revolutionary real-time collaboration (rTc) feature, everyone can be on the same page, at the same time - true collaboration achieved! 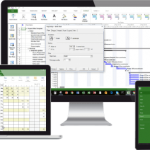 Project Plan 365 is engineered to be as fully compatible with Microsoft Project as possible, yet provided at a fraction of the cost. The file format used by Project Plan 365 is the same as used by Microsoft Project (.mpp), making it a no-brainer to share your project work with others who are using any flavor of Microsoft Project. Project Plan 365 has all the features you need as a busy project manager, to include built-in templates for quickly getting your plan off the ground, and out-of-the-box reporting that allows you to report on tasks, milestones, baselines and more – all in just one click or tap. Here is a list of some of the newest features found in Project Plan 365.